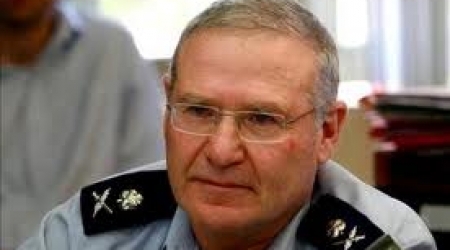 Former Israeli intelligence chief Amos Yadlin was briefly detained and questioned by the British police at London's Heathrow airport upon arrival on Monday to an arrest warrant pending against him that had been issued by Turkey in connection to the Mavi Marmara affair, Hebrew media reported. After an investigation conducted by immigration officers in conjunction with the British Foreign Office, Yadlin was allowed to enter the country and proceed on his way. About a year and a half ago Turkey's chief prosecutor filed an indictment with an Istanbul court against four Israeli officers for their "responsibility for the massacre on the Turkish ship Mavi Marmara': Former Chief of Staff Gabi Ashkenazi, former Navy Chief Eliezer Marom, Air Forces intelligence director Avishai Levi and Yadlin. The Israeli occupation forces (IOF) on Friday afternoon quelled the West Bank peaceful marches protesting Israel's violations against the Palestinians and its settlement activities. Dozens of Palestinian and foreign activists suffered injuries when the IOF violently attacked the march organized in Masarah village to the south of Bethlehem. The protestors marched from the center of the village to the segregation wall, carrying Palestinian flags and pictures of martyrs and prisoners. Some kids wore masks commemorating the horrors of Sabra and Shatila massacres. In Bil'in village near Ramallah, four anti-wall activists, including a Swedish woman, suffered severe tear gas suffocation when their march was attacked upon their arrival at an area near the segregation wall. The IOF also suppressed the Friday march in Nabi Saleh village, using tear gas grenades, skunk water and rubber bullets and other dispersal methods while the Palestinian activists responded by hurling stones. Nabi Salih residents have hosted weekly demonstrations for three years in protest at the confiscation of the village's lands and the takeover of their spring by the nearby Israeli settlement, Halamish. Four Palestinian citizens were injured with rubber bullets and many others suffocated from tear gas in Khirbet Makhool hamlet when the IOF attacked the villagers along with foreign activists as they were trying to rebuild temporary homes for the displaced families. All residents of Khirbet Makhool hamlet in the Jordan Valley are still homeless after the IOF demolished their village recently and later confiscated tents brought for them by the Red Cross. Dozens of activists were lightly injured on Friday in demonstrations across the occupied West Bank. 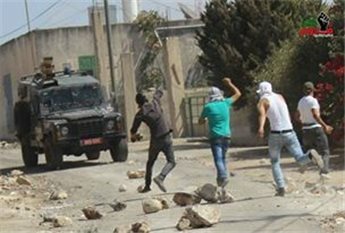 In Kafr Qaddum near Qalqiliya seven people were injured after being struck by tear-gas canisters in different parts of their bodies. A Chinese journalist was struck in the knee, photojournalist Ayman Idrees was struck in the chest, Moaweyah Shtewi, 17, was struck in the hip, while both Raed Nasser and an Israeli activist were struck in the shoulder. Demonstrators marked the 31st anniversary of the Sabra and Shatila massacre, and called for punishing those responsible for it. Coordinator for the popular struggle committee Murad Shtewi said that Israeli forces targeted the bodies of demonstrators and fired tear-gas canisters into homes. In Bilin, three Palestinians and a Swedish activist were injured and dozens others suffered tear-gas inhalation in a protest in solidarity with Jerusalem and prisoners. Israeli soldiers fired rubber-coated steel bullets, tear gas, and stun grenades at protesters nearing the wall. Hamza Burnat, 21, Ismail Abu Rahma, 15, Ashraf Khateeb, 31, and Sara Jon, 40, were struck with tear-gas canisters in different parts of their bodies. In Nabi Saleh, protesters marched toward their confiscated lands but were stopped by Israeli forces who fired tear gas and rubber-coated steel bullets. Protestors made speeches condemning the Sabra and Shatila massacre and calling for the release of all prisoners. 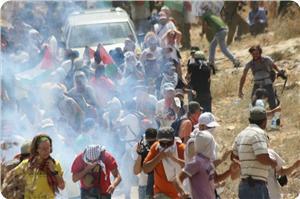 Dozens suffered tear-gas inhalation in al-Maasara south of Bethlehem. Protesters raised Palestinian flags and pictures of prisoners, and children wore masks to represent people who died in Sabra and Shatila. Hamas movement said that the Sabra and Shatila massacre, which took place 31 years ago, is a crime against humanity and will not be subject to a statute of limitations. The movement championed in a statement on Tuesday more efforts to achieve national reconciliation within a unified struggle strategy that adopts the resistance as a way to retrieve the rights and defend the constants. 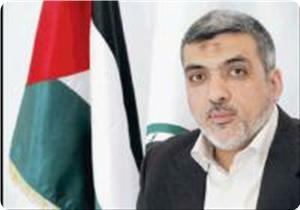 Hamas called for halting the negotiations and all forms of security coordination with the Israeli enemy, adding that the occupation is using the futile negotiations as a cover for its crimes against the Palestinian people, land and sanctities. The statement marked the 31st anniversary of Sabra and Shatila massacre, which took place on the 17th of September in 1982; when the occupation and its agents committed a horrible massacre against unarmed civilians in the Sabra and Shatila camps in Beirut and killed nearly 5,000 people, including women, children, infants and elders. Hamas said in its statement: "Thirty-one years have passed since this heinous massacre, yet the Israeli occupation continues its systematic crimes against our people, our land, Jerusalem and our holy places without being deterred or brought to account due to international silence. However, our people will not forget or forgive, and the Israeli war machine will not succeed in displacing or annihilating them". The movement also stressed that it will always adhere to the Palestinian rights and constants and to the resistance as the way to confront the occupation and prevent its crimes and racist plans against the Palestinian people. It called on the Arab League, the Organization of Islamic Cooperation and the countries hosting Palestinian refugees to shoulder their responsibilities by protecting the refugees and providing them with a decent life, until they are able to return to their homeland, from which they had been forcibly displaced. It also called on the human rights and humanitarian organizations to file lawsuits in international forums to prosecute those responsible for the Sabra and Shatila massacre and other massacres against the Palestinian and the Arab peoples. MP Hosni Bourini stated that the Israeli crimes against Palestinian people did not stop since the occupation of Palestine in 1948 until the present day. MP Bourini, affiliated to Change and Reform Bloc, said on Sabra and Shatila Massacre anniversary that this massacre is part of a series of the Israeli heinous crimes against Palestinian people. The international silence and the Arabs' insistence on peace negotiations with Israel, despite its crimes, have encouraged the Israeli authorities to carry out more crimes against the unarmed people of Palestine, he said. The ongoing negotiations for the past twenty years have constituted a legitimate cover for the Israeli crimes, he added. The MP stressed that Sabra and Shatila massacre remains a witness to the ugliness of the occupation who committed the most egregious crimes to terrorize the Palestinian people into abandoning their land. 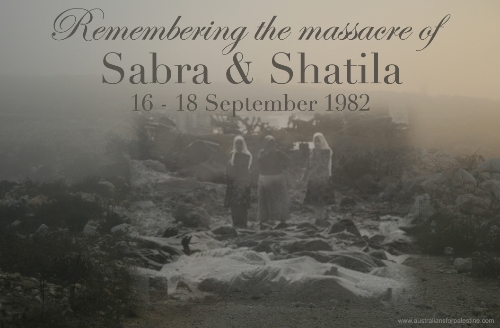 "On the 31st anniversary of the Sabra and Shatila massacre, we take this opportunity to remember the victims of that dreaded episode and recall the importance of working to end impunity for such crimes," PLO Executive Committee Member, Dr. Saeb Erekat said in a press statement on Monday. On this day 31 years ago, the Lebanese Phalange militia in collaboration with the Israeli army, slaughtered countless Palestinian refugees, mostly women, children, and elderly in the Sabra and Shatila refugee camps in Beirut. With Palestinian fighters having withdrawn from Lebanon just a few weeks prior, and the Israeli army in effective control of the area around the camp, the residents were absolutely defenceless. The massacre took place over a 3-day period. Dr. Erekat added, "31 years later, there is still no justice for the victims. In fact, those responsible, including then Defence Minister Ariel Sharon, would go on to have very successful political careers, adding further insult to the injury." "Unfortunately, this was not the first or the last massacre to take place in our history. It is our responsibility and our right to take all measures to protect our people, deter such crimes, and seek accountability for the perpetrators by relying on the system of international criminal justice. That is a primary duty of any government." Dr. Erekat concluded, "While negotiations are ongoing, we want to assure our people, from Sabra and Shatila to Yarmouk, that a solution to the refugee issue in compliance with international law, including UN General Assembly Resolution 194, will be the cornerstone of any agreement. The rights of refugees have been denied for too long, and there can be no lasting and just peace so long as that continues to be the case." Monday marks the 31st anniversary of the Sabra and Shatila massacre that took place starting on September 16 1982, after the Israeli occupation army, led back then by Ariel Sharon, surrounded the refugee camp after invading Beirut, and granted access to the Phalanges to enter the camp to slaughter its refugees. The massacre lasted for three days (16, 17 and 18 of September 1982), approximately 3500-8000 persons, including children, infants, women and elderly were slaughtered and murdered in his horrific and gruesome massacre perpetrated by the Israeli army and its allied criminal militia. Back then, around 20.000 refugees lived in the refugee camp that was supposed, as any other camp, to receive international protection. Israeli soldiers, led by Sharon and Chief of Staff, Rafael Etan, made sure their forces are surrounding the refugee camp, isolated it from its surrounding, and allowed the Phalanges to invade it and murder thousands of innocent refugees using white weapons. The Israeli army also fired hundreds of flares during the massacres in night hours to enable the murderers to commit their war crime. The army claimed that it was searching for nearly 1500 Palestinian freedom fighters who allegedly were in the camp. But the fighters were somewhere else, joining battle fronts countering the Israeli aggression, and most of those left in the camp, left to face their horrific end, were elderly women and children. Israel wanted to avenge its defeat after engaging in a three-month battle and siege that ended by international guarantees, to protect the civilians the Palestinian resistance left Beirut as part of an agreement that assured the protection of civilians. Israel wanted to send a message to the Palestinian refugees; it wanted to continue its aggression and invasion into Lebanon in 1982. Ariel Sharon, who served as Israel’s Defense Minister, led the assault. Following the massacre, Israel’s Supreme Court ordered the formation of a committee to investigate the circumstances that led to this ugly crime against thousands of helpless refugees. In 1983, the Cahan Commission announced the results of what it called “investigation” of the massacre, and decided that Sharon is “indirectly responsible” as he ignored the possibility of it taking place, ignored the danger of bloodshed and revenge. Sharon continued his political career, to become Prime Minister and held various important positions until he suffered stroke on January 4 2006, and has been in a been in a permanent vegetative state since then. The committee also denounced the stance of Israel’s Prime Minister back then, Menachem Begin, his Foreign Minister, Rafael Etan, and various military and security leaders, for not “doing enough to prevent or stop the massacre”. The massacre was not the first, nor the last, as Israeli soldiers carried out numerous massacres against the Palestinian people in different places including Deir Yassin, Qibya, Tantour, Jenin, Jerusalem, Hebron and so many areas. Not a single Israeli official, commander or soldier was ever held accountable for the ugly crimes, and massacres, against the Palestinian people. 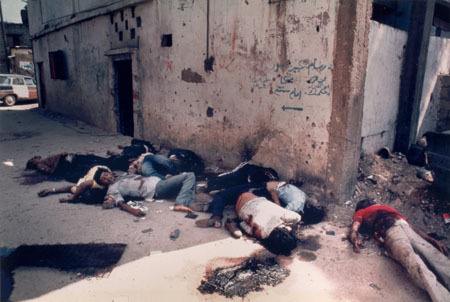 The massacre in Sabra and Shatila was carried out in direct collaboration with various leaders, including Saad Haddad, who was in charge of a unit of the Lebanese army before aligning himself in 1979 with the South Lebanon Army militia, and was working with the Israeli occupation forces. He also announced the so-called “Free Lebanon” forces in Lebanese territories that fell under illegal Israeli occupation in the south. Haddad dispatched members of his army from southern Lebanon to Bruit Airport, then to Sabra and Shatila, where they had a prominent role in the massacre. He died of a terminal illness on January 14 1984. Fadi Ferm, who was married to one of the granddaughters of the Phalange Party founder, Pierre Gemayel, was appointed by Bashir Gemayel as the leader of the Lebanese Force militia in 1982 after Bashir Gemayel was elected present, just one day before his assassination. Ferm moved through the ranks of the Lebanese Force, later on became the head of the Military Intelligence of the LF Militia, and then became the deputy chief before he became the commander. Bashir Gemayel, the militia commander, and president-elect in Lebanon, was a senior member of the Phalange party, and was the commander of the Lebanese Forces militia during the first several years of the Civil War in Lebanon between 1975 and 1990. During the Sabra and Shatila massacres, Gemayel was the leader giving the Lebanese Force militia orders to invade the refugee camps. He was elected president during the civil war, and while southern Lebanon was under Israeli military occupation. He was assassinated on September 14 1982, along with 26 persons, by an explosion that took place in the Phalange headquarters in Beirut. Months before Sharon and his army invading Lebanon, Bashir had a meeting with Sharon who told him that his army would be invading Lebanon to remove the Palestinian Liberation Organization and its fighters from the country. 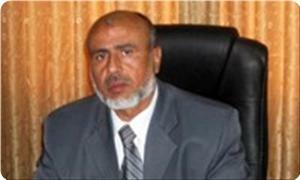 Member of Hamas's political bureau Ezzat Al-Resheq said on Sunday that the Sabra and Shatila massacre would remain a curse hunting its perpetrators until they get their comeuppance. Resheq stated on his Facebook page on the 31st anniversary of the massacre that the Palestinian generations would never forgive the crimes of the Israeli occupation and its allies, stressing that the blood of the Palestinian people would be a fire burning everyone involved in shedding it. Resheq also criticized the Palestinian Authority's persistent peace negotiation with the Israeli occupation despite 20 years of failure, affirming that its resumption is only a desperate attempt to try and impose new defeatist solutions on the Palestinian people.